Fátima and Santiago de Compostella in Spain constitute the great pilgrimage sites of the peninsula, with Fátima receiving greater numbers. It must count as one of the world's great ironies at this, holiest site in the Iberian Peninsula, is named for Fátima, the daughter of the founder of Islam. 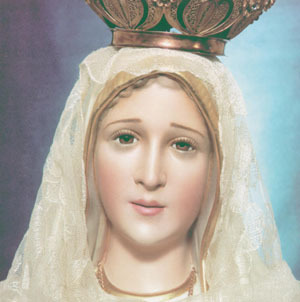 Fátima became holy when, on May 13, 1917, the sky suddenly brightened causing three young children to look up to see the Virgin Mary standing in an oak tree. Their report was met with disbelief by most, but the children staunchly claimed that Mary promised to return on the same day of each ensuing month, pledging a miracle for her sixth and last appearance. Increasingly large crowds gathered on each succeeding 13th to hear Mary call for peace, a particularly appropriate message for those World War 1 times. On October 13, the sixth month, 70,000 people gathered in a driving rainstorm. At noon the sun same out, spun in orbit and plummeted toward the earth. Then everything returned to normal, with no evidence of the rain. Her apparitions literally put Fátima on the map. The town has subsequently attracted millions of visitors, the illustrious and the povery-stricken. The Church has recognized many "cures" that have taken place after patients bathed in the springs, labeling them "true miracles." 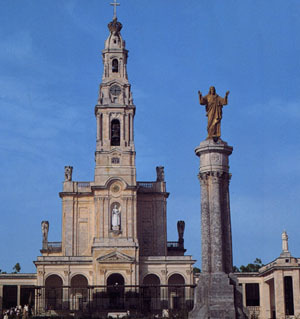 The Basilica of Fátima stands at the end of an immense esplanade. This neoclassical church can hold 300,000 inside, but only those who are dressed properly - no shorts, no bare arms, no slacks on women - are permitted entrance. Inside, two of the three children who first saw the vision are buried. The square in front is larger than the one prefacing Rome's Saint Peter's Cathedral. The Capelinha das Aparicoaes, on the esplanade is a modern structure surrounding the site of the visitation-alas, the oak tree is no more. Fátima is place of prayer. Every May 13th, Anniversary of the Virgin's first apparition at Fátima, upwards of 100,000 pilgrims gather at her shrine. Most Holy Virgin, who hast deigned to come to Fátima to reveal the treasures of graces hidden in the recitation of the Rosary, inspire our hearts with a sincere love of this devotion, that meditating on the Mysteries of our Redemption recalled therein, we may obtain (here name your special request), which we ask of you in this Novena, for the greater glory of God, for your own honor, and for the good souls. email us info@religious-travel.com © Copyright Best Catholic Pilgrimages.